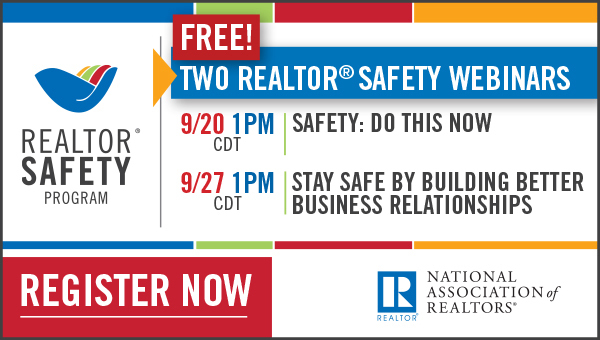 This REALTOR® Safety Month, join NAR for two FREE webinars – September 20th and 27th, at 1pm CDT. During REALTOR® Safety month, the NATIONAL ASSOCIATION OF REALTORS® is offering two free webinars to share tips on how to minimize risks in your business interactions. Join us on September 20 at 1pm CDT for “Safety: Do This Now” presented by Andy Tolbert, and September 27 at 1pm CDT for “Stay Safe by Building Better Business Relationships” presented by Tamara Suminski. Register for one or both of the free REALTOR® Safety Webinars today and visit www.NAR.realtor/Safety for additional details about the webinars and to view other safety resources.